The protesters reportedly “chanted” pro-life messages after the flick was over, then applied red tape labeled with the word “LIFE” to their mouths and kept on protesting. What would Dr. Seuss think (WWDRST?). So, even though my better judgment told me that Dr. Seuss would never really have approved of the anti-choicers' enthusiastic support, I still had to go poking around online to find some evidence, and site after site confirmed my hunch. 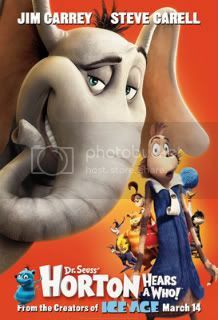 The book (most notably Horton the Elephant's recurring phrase "a person's a person, no matter how small") has found its way to the center of the recurring debate, in the United States, over abortion. Several pro-life groups have adopted the phrase in support of their views; the American Life League has even published a pamphlet using the phrase as the title. This has brought sharp criticism from Dr. Seuss' widow, Audrey Geisel, and at least one lawsuit was filed in Canada in 2001 to stop the use of the phrase. Before his death, Seuss himself threatened to sue a pro-life group for using the phrase. So, I guess I have to give the forced-pregnancy movement some credit here. It takes courage to co-opt a famous line and reinterpret a message from a children's story when the creator of that story never meant what you wish it meant and was willing to take legal action to keep you from preaching your incorrect bastardization of his work.